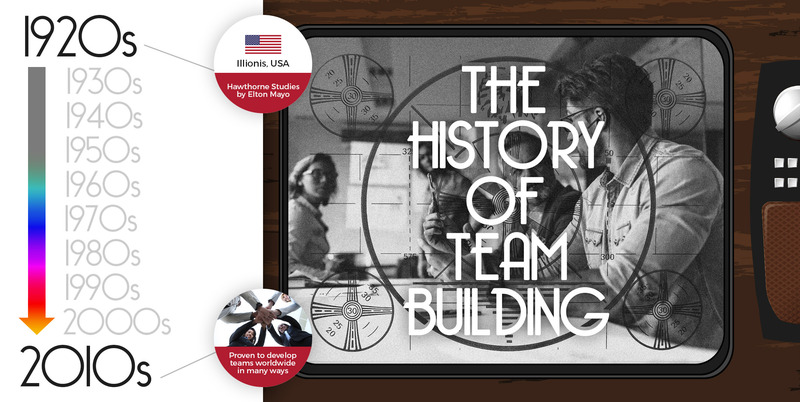 Now we all know what team building is, but where did it all come from? To find out exactly how team building is the way it is now you would have to go back around 100 years, that is how long researchers have been figuring out and examining all the different types of behaviours there are in teams within the workplace. It is definitely interesting and very useful to understand how all of this came about and why it was invented in the first place because from this you should be able to make sure that all of your future team building events have a clear purpose with successful results. You would probably have to go right back to the 1920s and look at The Hawthorne Studies which was ran by Elton Mayo, he was an orga­nisa­tional theorist who is regarded widely as the pioneer of all social experiments that deal with employee behaviour within the workplace. In a nutshell, The Hawthorne Studies are a series of experiments which happened in the years of 1924 and 1932 at the Western Electric Factory in Illinois in the United States. It started off focusing on manipulating the levels in the working environment to find out if it would have any sort of effect on workers’ productivity. Usually Elton Mayo split workers into two groups, he would then change the lighting and work structure such as working hours and break times of one group and keep the other groups (the control group) the same. And of course an increase in the productivity of the first group was observed. But then when they dimmed the lights back down the productivity of the first group remained high for the majority of the experiment and then gradually dropped back down again. From this we are able to understand that the workers increased their efforts in their work because they were with managers who shown an interest in their well-being and their willingness to improve the conditions they were working in, with things such as the lights and the increase in breaks and decrease in working hours. Not only that but the productivity was also boosted just from a change in their environment, in will have felt like a break away from work due to the fact that they were not in work so it was therefore not part of their daily working routine. This analysis and observation is known as The Hawthorne Effect. And now here we are, in 2018, taking our employees outside of the working environment in order to improve their team work, productivity and positivity within the workplace. And if you are after planning your own team building event why not check out our Team Building Locations and Team Building Activities?